On the Way to ONEderland: Must. Not. Succumb. Am going to eke out a win today if it kills me, but afternoon sleepy-time/munchie-time is getting me down. My eating was supposed to be a thing of beauty all day, given that I carefully planned my week's meals on Sunday, and then even stepped into the kitchen to pre-prep my lunch salad last night so I would have *no excuse* for eating off plan. My delicious breakfast was scarfed before I remembered to snap a pic for posterity. But it was a slice of Swedish dark bread, a schmear of (full-fat, gasp!) cream cheese, a sliced tomato and a piece of smoked salmon (aka lox). I forgot to eat my nectarine. I find the fattiness of the lox and cream cheese with the chewy bread gets me through the morning feeling just fine, thank you very much. It doesn't look like much but I'd already decimated a good chunk before I snapped the pic. 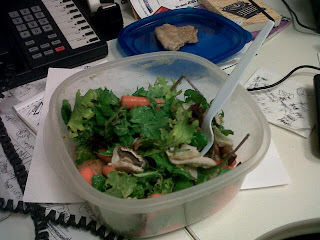 It has greens, carrots, mushrooms, guacamole and some turkey. I was even able to get a bonus bike ride in (not much tho, just about 5 blocks for an errand), and am now anxiously waiting until 6pm when Yoga starts. This is where things have veered just a little off plan. My late afternoon snack was an apple and peanut butter. And I ate the apple, and then didn't stop eating the peanut butter. This bad boy just donated an additional 500 calories to the Ishmael Wide Hips Fund, I reckon. About 3 extra spoonfuls got into the gob before I came to my senses and shoved it away. The good news is I am no longer hungry, and that snack has to get me through an hour of yoga and a solid 40-minute bike ride home. This is one of those things that you have to balance out, a bit. On the one hand, a few extra spoonfuls is not the end of the world. 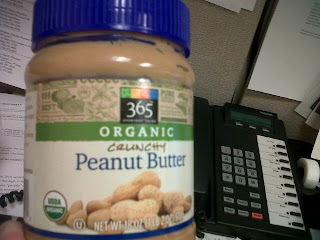 On the other hand, it was peanut butter -- full-fat, high-caloried peanut butter! Couldn't I have overindulged with more fruit, for a change?! I will not let that get me down. Soon I will be biking home, and I will feel totally different than I do right now. In the meantime, until I can get to Yoga, I'm going to go get myself a cup of tea, drink some more water, and annoy my colleague. 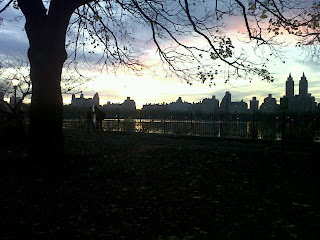 Last night we had a dusky walk around the reservoir -- this picture doesn't do the scene justice, but it was gorgeous. 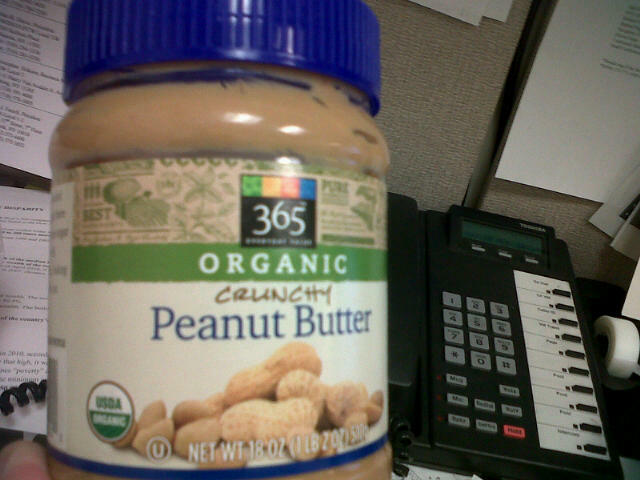 I have that problem with nuts and nut butters at times. Not sure why, but I can have control issues. Stress: What do we do without it?